Part of my packing is the process of cleaning and sorting our high altitude cook sets which comprise of 2 x pots, 2 x bowls, 2 x spoons, a plywood base to put the stove on in the snow so as the cooker does not melt into the snow, 1 x filter so as we can drain the water so as to not have bits of foreign debris in the water and of course 1 x stove. Over the past 3 years we have been working with a Japanese company Soto to develop a small light weight stove suitable for high altitude. In fact this is actually an intelligent stove that adjusts gas pressure according to altitude so as it becomes more efficient and therefore uses less gas. We always have trouble with self-igniters, but in the last few years we have been able to make improvements to this as well. A small but vital piece of equipment that we rely upon so much. 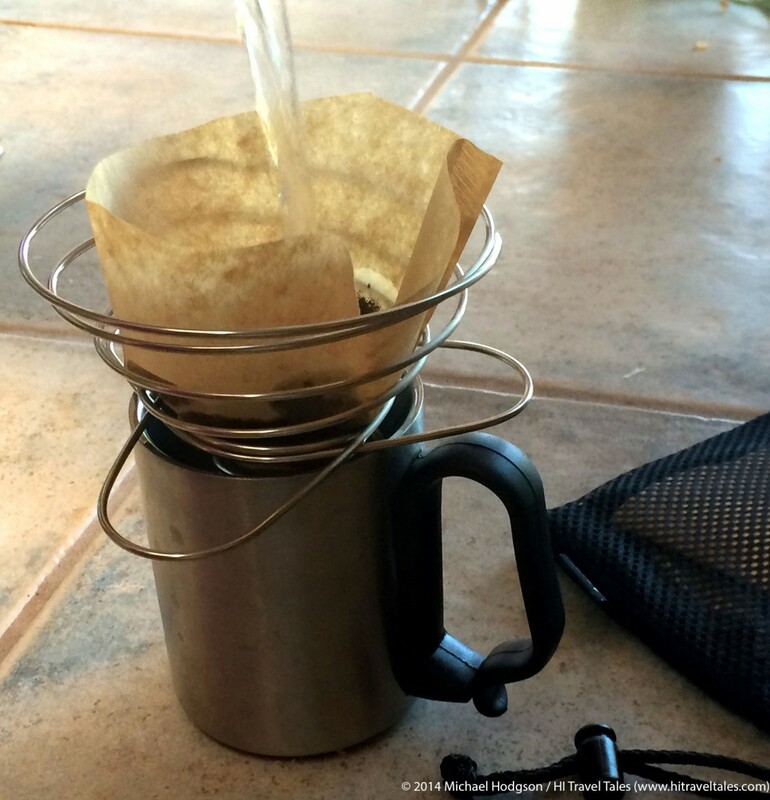 Traveling coffee addicts need the Soto Helix Coffee Maker. We at HI Travel Tales are coffee addicts. Yes, we admit it. But we are also coffee snobs. Just any old cuppa won’t cut it. We want a good, full-bodied one from quality beans. When packing in the backcountry, car camping, or bouncing between hotels and rental abodes, you never know what kinda brew you’re going to end up with. That’s why we’ve taken to packing along our own press mug or cone/filter with our favorite grind. Read more. What does a HITT Seal of Approval really mean? 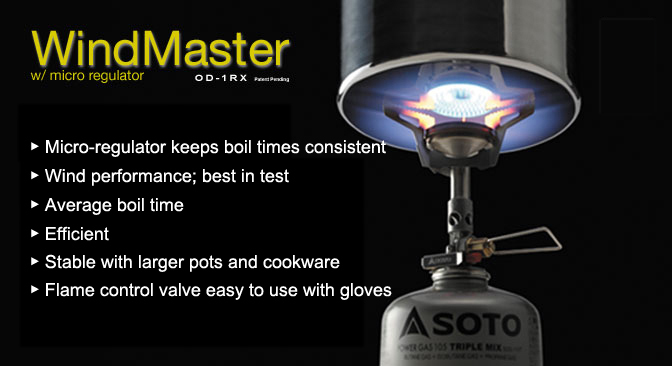 Given its weight, efficiency, performance in wind and average boil time, the Soto WindMaster is the superior stove in this category. It is pricey, but you do get what you are paying for. 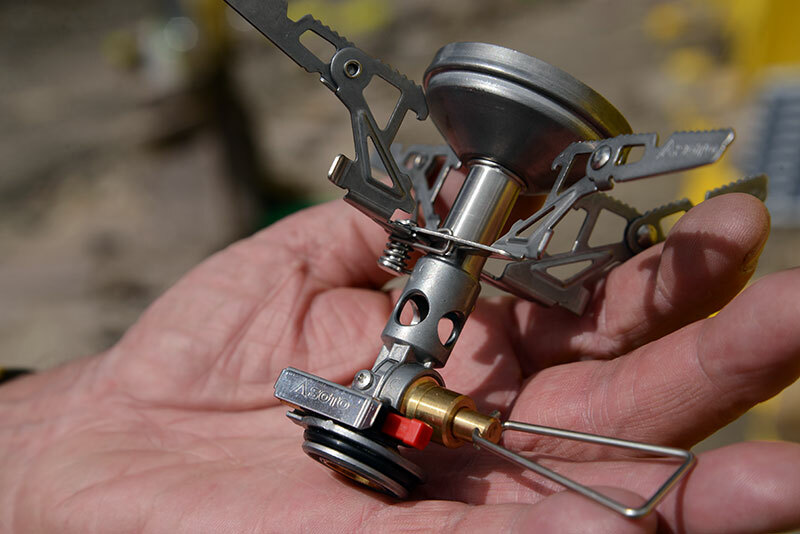 The micro-regulator is an impressive inclusion on a stove of this size and it performs as advertised, maintaining boil time consistency and performance in temperatures most canister stoves can’t handle. For the test review, visit http://www.gearinstitute.com/hiking/item/soto-windmaster. WindMaster receives “Outdoor INDUSTRY AWARD 2013” in the Camping Equipment category. Incredible! 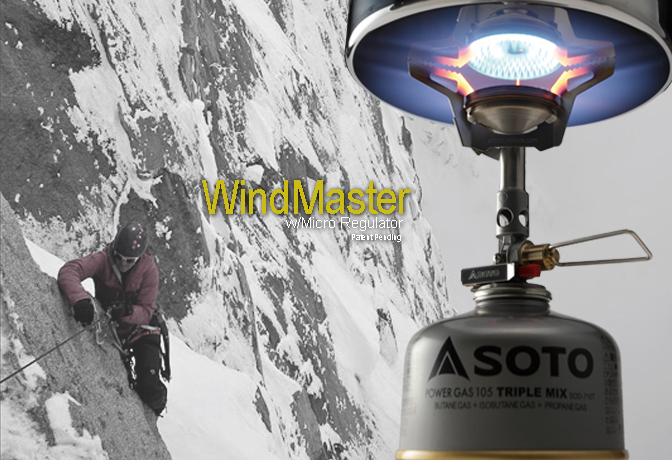 A super-stove that fires up and continues to burn under the windiest conditions without a windscreen. 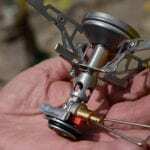 The MindMaster with Micro Regulator technology forges ahead among backpacking stoves out-performing the rest. 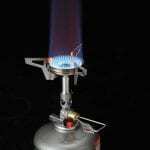 This lightweight, space saving stove includes multi-size, replaceable pot supports, and a volcanic shaped burner head. 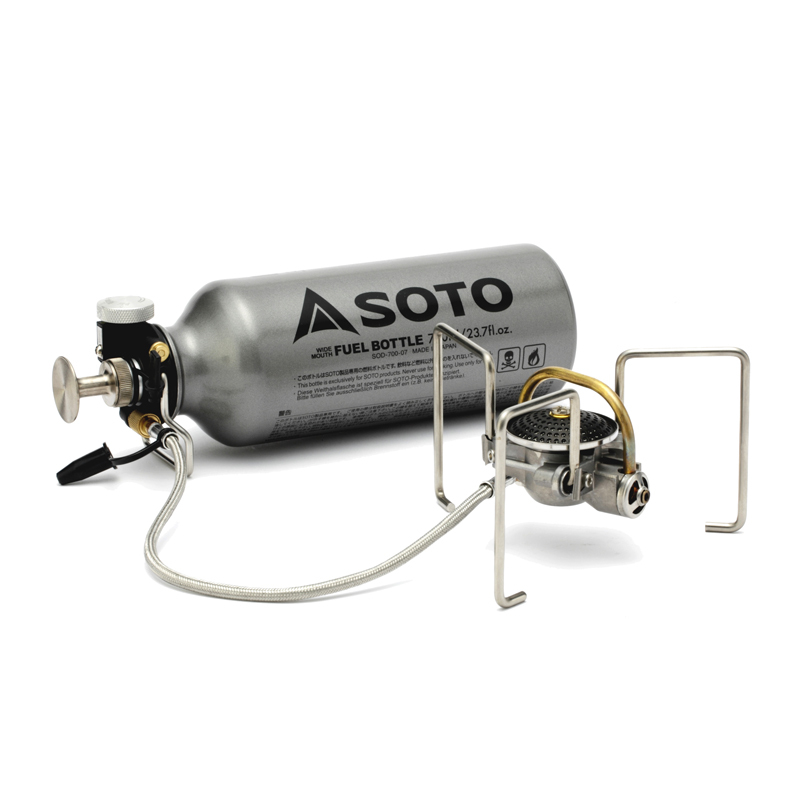 SOTO’s engineers have succeeded in achieving a minimal distance between the base of the pot and pot support for superior burning efficiency under windy conditions. Next time you’re tired, cold and hungry on the trail, prepare your meal on the WindMaster and you’ll be enjoying a warm dinner in no time. The WindMaster is tested by Ruediger Flothmann from ICH LIEBE BERGE.ch. It received 90 out of a possible 100 points! SOTO’s Muka Stove in Patagonia. The stove provided us with warm food 24/7 on our treks, which was essential to keep the spirit up. At the ISPO 2013 SOTO’s MUKA stove was honoured with the gold award. We thank the guys at SOTO for they’re great support with the products! Beat the clouds! Meticulously engineered and crafted, SOTO’s new WindMaster out-performs its competitors under windy conditions. On a stormy, blustery day, the WindMaster is able to maintain a strong flame. Tired. Cold. Hungry. Wind is blowing 3m/sec. No worries with the WindMaster! Hot dinner coming right up. Designed to position pot close to the flame—nearly impossible for the wind to penetrate this stove’s flame. Be confident, a warm dinner is just minutes away. SOTO’s MUKA STOVE wins the GOLD Award at the ISPO AWARD 2013. EpicTV interviews Tomo Sekiguchi from SOTO at the OutDoor Show in Friedrichshafen, Germany. Adventure-starved, cutting-edge viewers of EpicTV get a sneak preview of the world’s first non-priming, hybrid gas stove that has been reduced to the essentials. The Muka Stove is one of only 10 Gold Award winners at the largest outdoor trade show in all of Europe. Get in on some of the action with this clip of the interview. SUMMER 2012, FRIEDRICHSHAFEN, GERMANY. SOTO’s MUKA STOVE wins the GOLD at the OutDoor INDUSTRY AWARD 2012, the world’s leading tradeshow for the outdoor industry. The Muka Stove was selected for its particularly outstanding innovation and design achievement from a total of 322 entries from 25 countries around the world. In examining the entries, the judges paid particular attention to the following: degree of innovation, design quality, workmanship, choice of materials, environmental compatibility, sustainability, functionality, utility, safety, trendsetting character and brand value/branding. So, pump up the fuel tank, open the valve wheel and the flame ignites: a hybrid gas stove that doesn’t require any preheating. 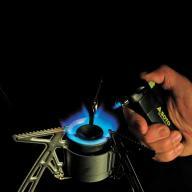 The “Dual-Groove Drum System™” makes lighting the camp stove as easy as lighting an indoor gas range. 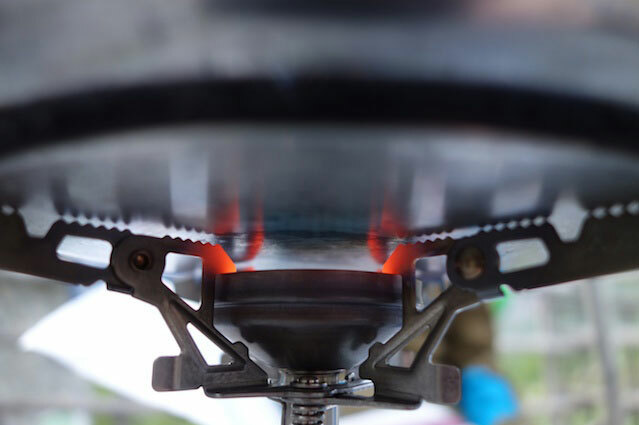 The Muka Stove is equipped with a pressure gauge on the “smart pump” so that the user can see how much pressure is building up inside the aluminum tank. The small aluminum stand and a very flexible hose make the stove very ergonomic. SOTO’s 3-fold commitment to user-safety, user-friendliness and environmentally friendly design sparked by nature, has done it again with the Muka Stove. Just a quick note to inform you that we just used your MUKA stove (OD-1NP) at -40 below! We are most impressed!! We gave the stove a good fair -40 below C trial and it worked remarkably well. Will send you the images and comments etc. asap and meantime will put it to work and see if we can fault find or destroy it!!! Dave King— Dave has been operating a Guide Service (PolarQuest Expeditions) for the past 27 years in Alaska prior to moving to his current base in Lappland North Sweden. He maintains a kennel of 40 Sleddogs and runs an expedition guiding & outfitting business in Norway & Spitzbergen. SUMMER 2011, SALT LAKE CITY, UT. 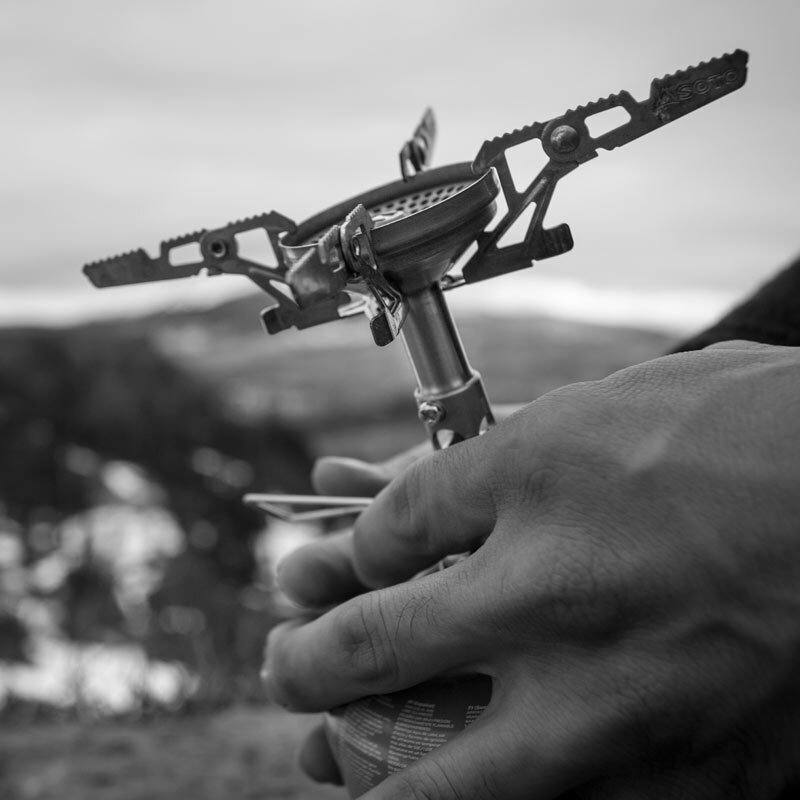 Backpacker Magazine awards SOTO with the “Editors’ Choice, Snow Award” for the revolutionary liquid stove, the Muka stove. SUMMER 2010, SALT LAKE CITY, UT. It has been a stellar year for SOTO. Backpacker Magazine presents SOTO with the “Editors’ Choice Award”, for the Micro Regulator Stove and the Pocket Torch. 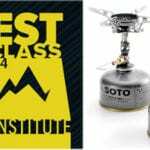 SOTO also receives the “Editor’s Choice Award” from Europe’s authoritative magazine, ”Outdoor”, for the Micro Regulator Stove. The magazine editors test the market’s most innovative products in the field under extreme conditions to determine the “best of the best.” SOTO’s realization of their responsibility and commitment to developing and manufacturing all-around well-designed products that set SOTO apart as the leader and flagship manufacturer in the industry. The industry’s leading magazines are recognizing SOTO for bringing state-of-the-art technology to the world market. SOTO’s realization of their responsibility and commitment to developing and manufacturing all-around well-designed products that set SOTO apart as the leader and flagship manufacturer in the industry. The industry’s leading magazines are recognizing SOTO for bringing state-of-the-art technology to the world market.